One of the biggest health problems that we are facing today is the issue of uncontrolled weight gain and for most of us it seems to be an unwinnable battle. While a strict restrictive diet and regular exercise are the only ways to promote weight loss, but it becomes difficult to stay consistent to such a strict regime at all times. What if I tell you that that there is a quick and easy way to lose a few kgs with in just 7 days? Yes, you heard me right. 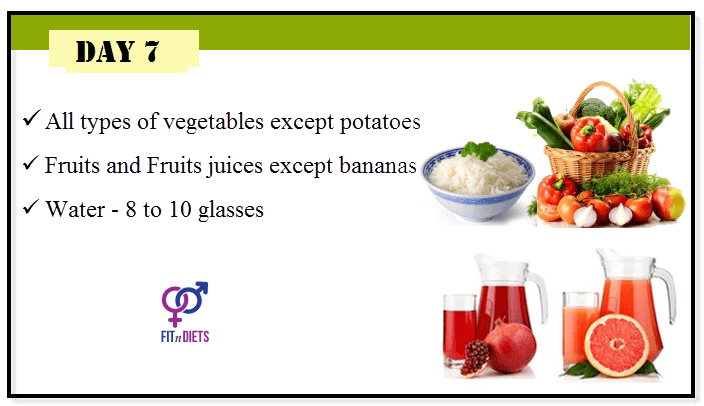 I am talking about the 7 Days vegetarian GM Diet that helps to lose almost 5 to 8 kgs in a week without any exercise. Beginning your weight loss journey with this diet plan is a great way to kick start your effort and prepare your body and mind for the upcoming changes. The GM Diet or General Motors diet was developed by the General Motors Company for its employees to lose weight in a healthy way. General Motors is said to have collaborated with the FDA (Food and Drug Administration) and the US Department of Agriculture to develop this diet for weight loss and it was first tested at the Johns Hopkins Research Center in the year 1985. 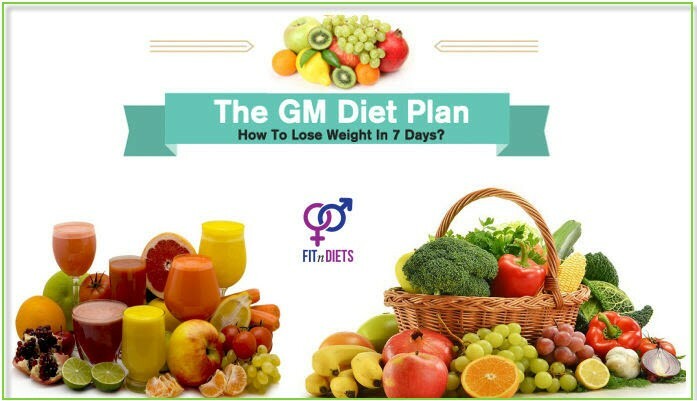 The GM diet is a 7 day diet plan which has been shown to promote weight loss of up to 10 to 17 lbs. (5 to 8 kgs) in a week. 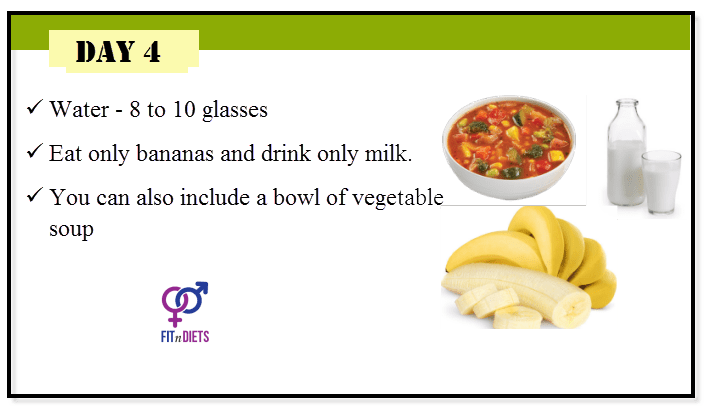 During the 7 days of this diet the candidate has to eat mostly fruits, vegetables, soups, milk, whole grains and lentils along with 6 to 8 glasses of water on a daily basis. These fiber-rich foods helps a person to stay fuller for longer and promotes calorie burn while the water helps to flush out toxins form the body. After completion of the GM diet you will not only feel lighter and healthier, your outlook towards food habit will change completely. You might find yourself making healthier food choices while avoiding unhealthy and processed foods. The best thing about the GM diet is that it is not a restrictive diet and it can be modified as per an individual’s requirements. There are several variations of the GM diet such as the GM diet Indian version and the 7 days vegetarian diet. Above all, the GM diet does not require you to starve; it only requires you to eat the recommended foods. Exercising is not a compulsion during the 7 days of the GM diet. If you want to stay active then you can opt for 30 minutes of brisk walking from the 4th day of the diet. Encouragement is the best motivational force that helps is in moving forward and the amazing results of the GM diet works as a wonderful motivation for those embarking on the weight loss journey. The GM diet not only helps to lose a few kgs within a short span of time, but also helps in detoxifying the body, thereby improving overall health. The foods included in the GM diet don’t put any pressure on the gut, thus, providing the much needed rest to the intestines which in turn improvise the functioning of the entire digestive system. 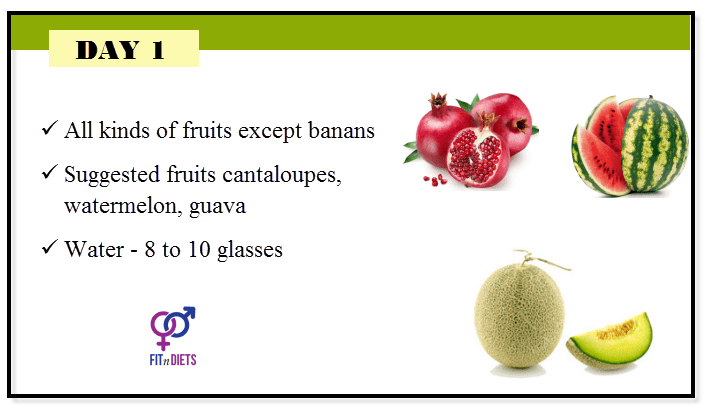 This is the first day of the GM diet plan and you are allowed to eat all kinds of fruits except banans throughout the day along with 8 to 10 glasses of water. This is one of the most difficult days of the diet where you might feel a bit weak along with slight headache. But, things get smooth once you conquer day 1. Apples, oranges, cantaloupes, watermelon, guava, pear, sweet lime, grapefruit, pomegranate, strawberries, kiwi, etc. Congratulations! You have crossed the most difficult part of the day and reached day 2. 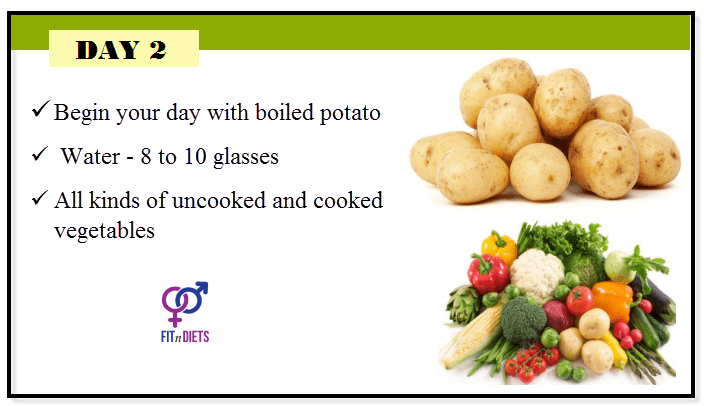 You can have all kinds of uncooked and cooked vegetables throughout the day on day 2 along with 8 to 10 glasses of water. You can have the vegetables in the form of salad, boiled or as a soup, but no oil should be used in the cooking. Begin your day with boiled potato and a dollop of butter to stock up on the carbohydrates to keep you going throughout the day. Carrots, cucumbers, lettuce, cabbage, green beans, bell peppers, cauliflower, broccoli, onions, spinach, etc. Day 3 of the GM diet is a combination of days 1 and 2. On day 3, you can eat both fruits and vegetables along with 8 to 10 glasses of water. You need to avoid potatoes and bananas on day 3. You will start feeling better day 3 onwards because more and more carbs will be added to your diet. Apples, oranges, cantaloupes, watermelon, guava, pear, sweet lime, grapefruit, pomegranate, kiwi, strawberries, carrots, cucumbers, lettuce, cabbage, green beans, bell peppers, cauliflower, broccoli, onions, spinach, etc. Day 4 of the GM diet is a deviation from the rest of the days because on day 4 you are allowed to eat only bananas and drink only milk. You can have 8 bananas and 4 glasses of milk throughout the day. You can enjoy the milk and bananas together in the form of a milkshake or smoothie. You can also include a bowl of soup on day 4 if you feel like. The difficult phase of the GM diet is over and it gets easier and easier from here. 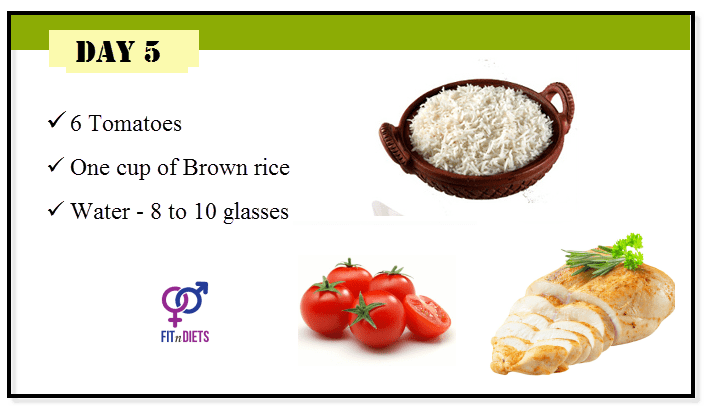 You can include carbs such as brown rice along with lean proteins such as chicken breast in your meals on day 5. You need to consume 6 tomatoes on day 5 which you can have either raw or in the form of a soup. On day 6 of the GM diet your can have all types of vegetables along with the brown rice. You can also have spouts and salads and non-vegetarians can have chicken and fish. 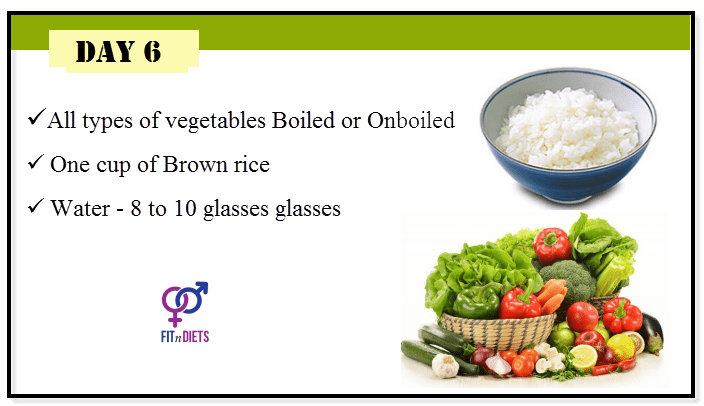 All types of vegetables except potato, brown rice, fish, chicken, cottage cheese (paneer), sprouts. 8 to 10 glasses of water. You have reached the last and final day of the GM diet. You can include all types of fruits and fruits juices to your meals along with brown rice, sprouts, cottage cheese and assortment of vegetables. What can you drink during the GM Diet? You can have as much water as you like on all days of the GM diet. Alcohol is not allowed in the diet. Soda, soft drinks, aerated drinks, sugary fruit juices are not allowed in the diet. You can have green tea, black tea or black coffee 2 times a day on all 7 days of the diet, but it should not contain milk, cream or sugar. The low-calorie wonder soup is one of the most important GM diet recipes that can be prepared on all days of the diet except day 1 and day 4. It is a great alternative for raw or boiled vegetables that not only helps to supply the essential nutrients to the body, but also promotes thorough detoxification which is extremely important for weight loss. Finely chop the cabbage, onion, celery, tomatoes and bell pepper and wash them thoroughly under running water. Now, pour the water in a deep bottomed pot and bring it to boil. Next, add the chopped vegetables along with the olive oil, salt, pepper and vinegar, cover the lid and let it boil for about 30 minutes or till the vegetables become tender. Open the lido f the pan and stir the soup at regular intervals to prevent burning. You can prepare a large batch of the soup at once and have it throughout the day. Following are some frequently asked questions about the GM diet plan for weight loss. FAQ1: Can everyone follow the GM diet? Any healthy individual, who is not suffering form any serious or chronic health condition can follow the GM diet. It is considered the best diet to lose weight because it cleanses and detoxifies the body along with burning the calories. 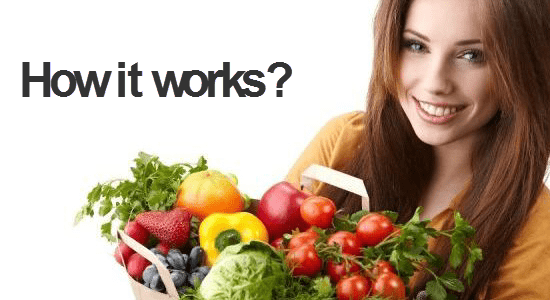 FAQ2: Does the GM diet really work? The GM diet mainly comprises of fruits, vegetables, whole grains and lean proteins which helps to burn calories and shed a few pounds within 7 days. But one might lose some muscles along with the fat and water, so it is best to follow the GM diet for a short duration, just to kick start your weight loss and detoxify the body. FAQ3: Can I add spices and oils to the foods in the GM diet? You can season the boiled vegetables, salads and soups with a pinch of salt, black pepper powder, lemon juice, chaat masala, red chilli powder, etc., but try to limit the use of oil and use only extra virgin olive oil if you must. FAQ4: Can people suffering from diabetes or high blood pressure follow the GM diet? People suffering from chronic diseases such as diabetes, hypertension and cardiac problems should not follow the 7 days GM diet because the diet cannot fulfil all the necessary nutritional requirements of such people. FAQ5: Can pregnant women follow the GM diet? Pregnant women and new mothers should not follow the GM diet because this diet cannot supply sufficient nutrition to pregnant women and new lactating mothers. FAQ6: What is the minimum age limit for trying the GM diet? Although there is no written age limit but it is advisable that people above the age of 18 years should opt for this diet. FAQ7: How to maintain body weight after completion of the GM diet? A well-planned and healthy diet along with daily exercise is the best way to maintain weight after completion of the GM diet. FAQ8: Can GM diet the followed as a long term diet? The GM diet is essentially a short term diet for quick weight loss; it should not be followed for more than 7 days at a stretch. 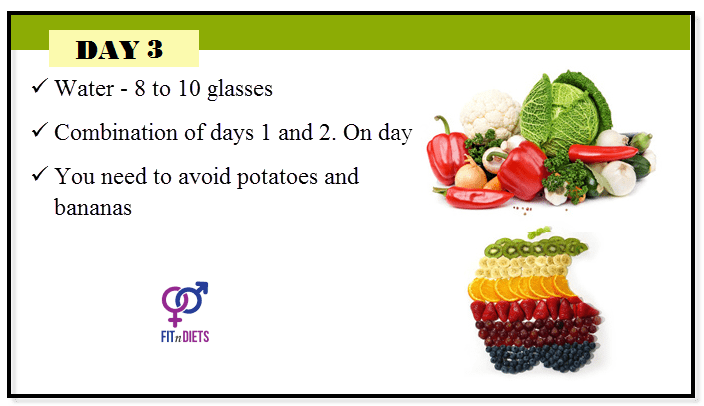 FAQ9: What should be the interval between two sessions of GM diet? It is recommended to leave a gap of 10 to 15 days between two successive sessions of the GM diet. Your 7 days GM Diet plan is ready for you. So, what are you waiting for? Follow a healthy and well-planned diet for just 7 days and achieve a slimmer, healthier and better body the next week. The GM diet is the ultimate answer to the question of how to lose weight fast. The GM diet is extremely popular in India because of its flexible attribute. GM diet for Indian population can be modified into a vegetarian diet to lose weight. Just stay focused and start following a healthier lifestyle that includes daily exercise and a healthy food choices in order to make the most out of the 7 Days GM diet.